Car dealers are often called to the whipping post of public outcry because a not so small army of them will charge you a bogus finance or documentation fee. It’s a stupid and pointless exercise of greed – but it’s done for one simple reason. In the car business, fees are everywhere. Car dealers, even those blessed few that run their own show such as Tesla, routinely pay fees out the yin-yang to a very small cabal of conglomerates. Forget one simple inflated bogus fee. When you buy or sell cars for a living the fees never stop because the billion dollar businesses you pay fees to are fiercely protected from any real price competition. The annual wholesale car market of over 9 million used vehicles has only a few strong competitors on a national level, and these companies have a chorus line of fees that would make even a tone deaf Broadway banker belt out showtunes: buy fees, sale fees, registration fees, internet fees, consignment fees, no-sale fees. Whatever you do or don’t do as a dealer there’s usually a fee or two for it. 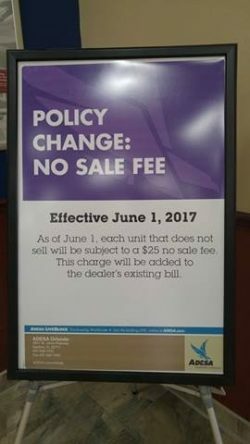 This fee culture is passed down from the dealers directly to you, the retail customer, Chances are if your car is ever leased, traded-in, repossessed or totaled, it will be sent to a dealer auction where the competition is restricted to a licensed few who have paid big money for access to a heavily protected wholesale car market. One company in particular handles a large volume of roadworthy cars, from 20 year old trade-ins to 2 month old Bentleys, along with those that are worth more dead than alive – KAR Auctions Inc. Yes, it really is spelled with a K as in, ‘Ka-Ching!’. There is little incentive to innovate in this wholesale market because the mega-auctions like the ones KAR operates have an extreme level of pricing power in a marketplace where the competition is either bought out, or limited due to technological barriers to entry. 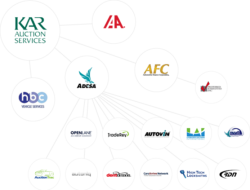 In the last six years, alone according to KAR’s web site, the company has built only two new auctions while nine separate businesses have been acquired. This lack of innovation has meant higher fees for car dealers and, as a consequence, a used car market with artificially high prices. Jim Brumbaugh, owner of AA Motor Sales for 14 years, has experienced the fee-driven market firsthand in the Florida auction market. When KAR Auctions bought out a formerly independent sale, Sanford Auto Dealers Exchange, the purchasing costs on even the smallest of transactions increased by over 40%. You may know plenty about cars and feel like you could easily purchase a car from a wholesale market, but your knowledge and expertise doesn’t matter because state laws are specifically designed to keep retail consumers away. You’re not invited. To make matters worse for the rest of us, there is one other pesky issue that can’t seem to go away. The stiff markup that the public now pays for the same exact vehicle. This spread is now in the thousands of dollars. 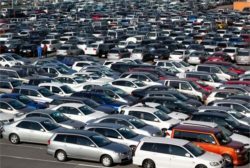 According to one industry study, the spread between the wholesale and retail premium on used car prices was recently over 35%. That’s on a retail used car transaction that averaged a hefty $18,500 back in 2015 and was just recently $19,134 in 2016. That’s a lot of wasted money for a protected market that shouldn’t even exist. But that pricing premium is paid by everybody who isn’t at the very top of the used car pyramid – and that rickshaw of financial woe can be as painful as it is abrupt. Sometimes poverty is caused by handouts. Not handouts to the impoverished or the penniless, but those given to the well-connected. These are the legalized theft cartels of the modern day. That’s the multi-billion dollar reality that now exists for all of us; the wealthy, the poor, and every other car buying consumer out there. It begs the question, “How can this heavily restricted wholesale market that benefits a chosen few become a retail market for the many?” The answer is politically complicated, but perhaps, if we want to become a nation of owners instead of debtors, it’s the one question that can’t be ignored. If we want to lower the costs of buying and selling used cars, opening up the market to more buyers and sellers would be the easiest and fairest way to do it. After all, who the heck should ever have to pay thousands more for a product that we now have well over 260 million of in the United States?